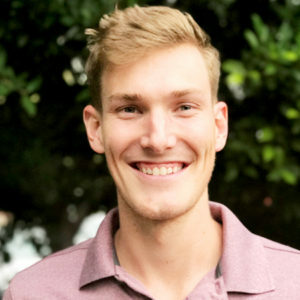 Research Collective approaches Human Factors from a Cognitive Psychology perspective. We believe that to develop products that serve the needs of people, it is crucial to understand how the human mind works. One facet of Psychology that is particularly relevant to Human Factors is something called Gestalt Psychology. Gestalt Psychology is a movement within Psychology that seeks to explain human perception in terms of “gestalts”, or wholes, rather than the different parts making up those wholes. For example, consider the figure to the left. 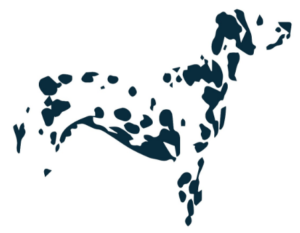 If I were to ask you what the subject of that image is, you would surely respond saying it is a Dalmatian. In reality, the image is simply an arrangement of variously-size blobs in the shape of a Dalmatian. Our brains naturally (attempt to) provide order to the stimuli we perceive. In this case, the fact that those black blobs meld together create a Dalmatian seems like the most obvious thing in the world. That is the core of Gestalt Psychology: the individual parts (blobs) make up a whole (Dalmatian), and our brains interpret the whole more easily than the parts. This natural inclination has an enormous impact on how humans perceive the world. 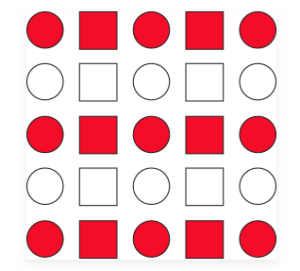 With so much information constantly bombarding our visual field, Gestalt Psychology helps describe a significant mechanism for making sense of it all. Gestalt principles are therefore very important to understand when studying how users interact with the products around them. The principle of similarity suggests that similar elements are perceived as a group. Us and them. X’s and O’s. Elements are naturally associated with one another because they may share the same color, shape, or even size. The more the elements have in common, the greater the sense of conformity (and the harder it is to mentally “undo” these groupings). The figure to the right demonstrates the principle of similarity in a couple ways. First, each vertical column is occupied by a certain shape. Second, and perhaps more powerful, is the impact of color; horizontal rows are either red or white. The principle of continuity states that people have a tendency to see continuous figures rather than distinct elements. 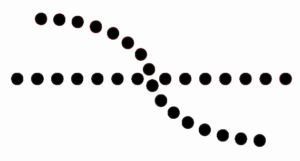 In situations where two objects intersect, like in the figures below, people are much more likely to see one curved line intersecting one straight line. Alternatively, people probably don’t see two curved lines nearly intersecting in the middle. Introduce some color, however, and things change. Rather than two lines neatly intersecting one another, it’s much easier to view the figure on the right as two lines that do not intersect at all. The human eye has a strong tendency to automatically fill in missing information. 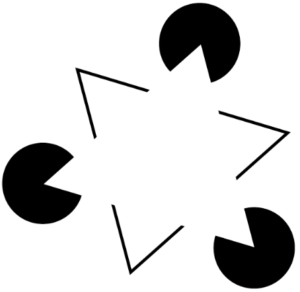 According to the Gestalt principle of closure, this means seeing closed shapes, even if they aren’t. The result is that humans tend to see complete figures even if information is missing. Take a look at the figure on the left. There are two triangles. Interestingly, neither triangle has a closed outline, but we see both quite easily due to our tendency to see closed shapes. Proximity, or grouping, is straightforward enough. We perceive elements that are close to each other as groups. It is notable that proximity/grouping still works even if the elements in question are completely different from one another in shape, size, or color. The figures to the right exhibit the principle of grouping. It doesn’t matter what shape each element is, the various elements can be clearly separated into their own groups (and subgroups!). The figure/ground Gestalt principle says that the human eye has a tendency to separate objects from their backgrounds. The figure on the left clearly demonstrates this effect because the figure-ground relationships between the elements change. 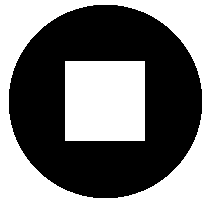 Is it a white square inside a black circle or a black circle with a square hole? This is not the most complex example, but it’s one of our favorites. Optical illusions on the Internet frequently feature the figure/ground principle. Images like these are popular because the viewer does not know which elements are figure and which elements are background. The Gestalt principle of symmetry and order suggests that the human mind naturally perceives objects as being symmetrical and is contented by symmetry or order. Respectively, the absence of balance or order tends to be unsettling. Consider the figures above. Having symmetry on both the horizontal and vertical axes, the left and center figures are somewhat satisfying to look at. By contrast, the figure on the right feels unstable. The lack of harmony is subtle, but it’s there. Human Factors is concerned with how humans interact with the world around them. The aviation, automotive, healthcare, and technology industries are particularly relevant in this regard. In order to develop safe and effective products for humans, we must understand the nature of human cognition. How do we interpret this information? How do we perceive that design? Why do we interact with it that way? The Gestalt principles described above are basic design concepts, but their impact on visual perception is paramount. The principles of similarity and proximity influence the placement, appearance, and design of functional buttons on a graphical user interface (GUI) or control panels. Meanwhile, incorporating continuity and closure give designers an opportunity to organize information in intuitive, yet minimalistic ways. We simply appeal to human perceptual tendencies to make designs more intuitive. The human mind constantly attempts to make order out of chaos. 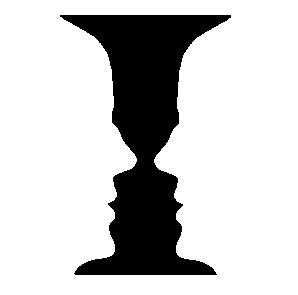 Gestalt Psychology is just one perspective that offers explanations as to how we do so. By understanding Gestalt principles, we have the ability to tailor a product to the user’s needs and intuitively improve clarity of designs.